October is proving to be a very fun month in my corner of the world. 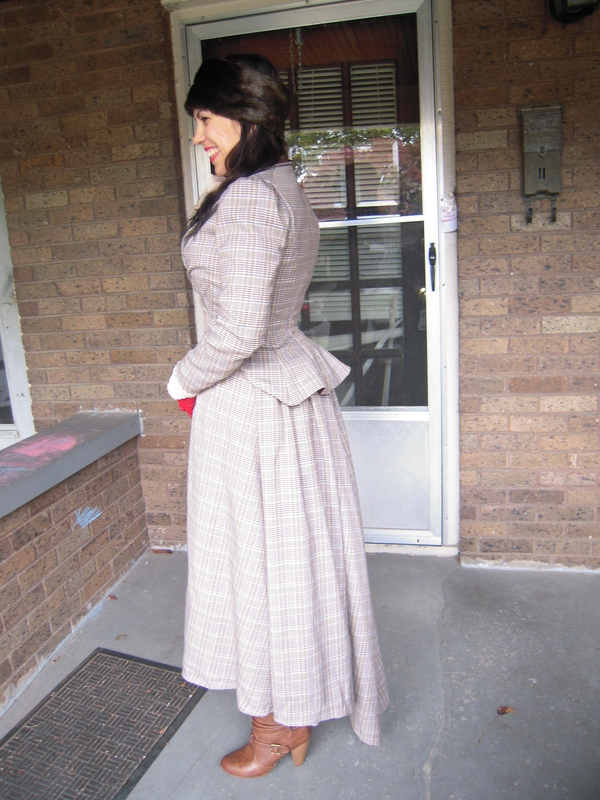 You might have already seen my Victorian costume I made for Ren Faire. Well, I used the same bodice pattern, tweaked it, drafted a new skirt and ended up with a costume I’m pretty proud of! In looking back at photos, I see that I was already planning and starting to draft before I even went to Faire so it was probably a 2 week project. Thanks to those of you who chimed in on Twitter and IG about the design. I waffle so much on this part and making design decisions can trip me up for days. 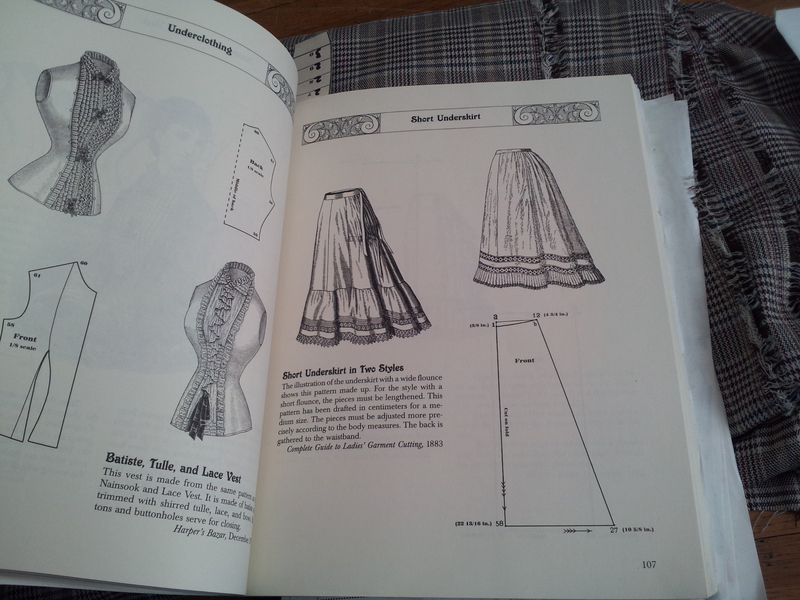 I started with this bodice pattern from Frances Grimble and Brooke held my hand while I drew the shawl collar. It was amazingly simple. The muslin stage helped clean up what I didn’t know how to do in the drafting. 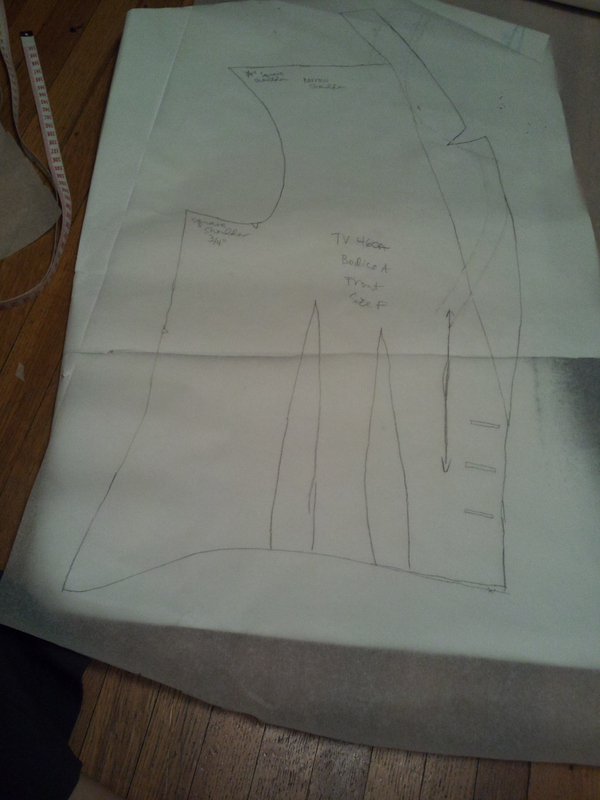 I literally just drew lines how I wanted them to look in the final garment, added seam allowances and muslined. I noticed in my last workings with this bodice pattern that I had a slight pulling at the back of the neck. I don’t think it’s super noticeable…until you notice. Brooke helped me figure out that I just needed to add a bit of length to the back of the neck and it totally worked. I can see I might want to do a little more tweaking before I make this again- which I will! 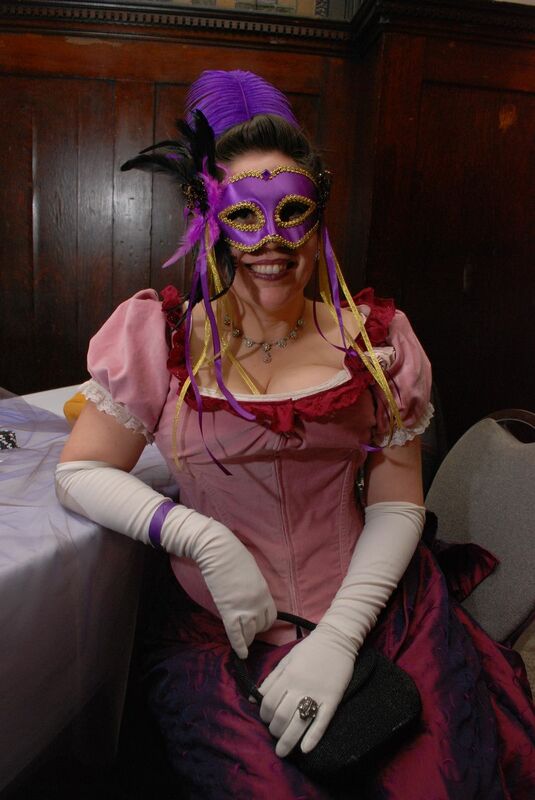 I’m going to the Steampunk ball in February again (me at the ball last year) and I’m using the same pattern to make the evening bodice. 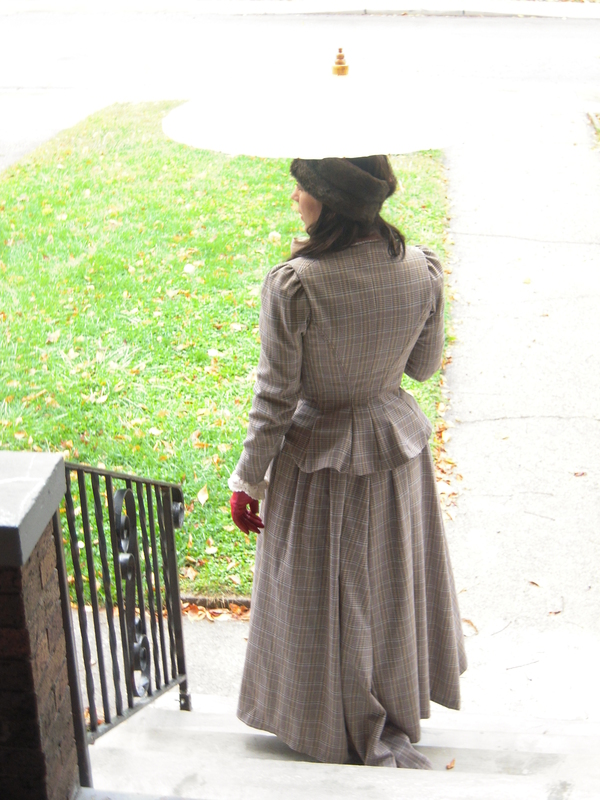 Made a couple of lightweight petticoats as all I have for my Victorian wear is late bustle period undergarments and I wasn’t wearing my bustle with this outfit. All the fullness is in the back so the pictures I posted to IG don’t show much. I might add a small bum roll though I like how it turned out. 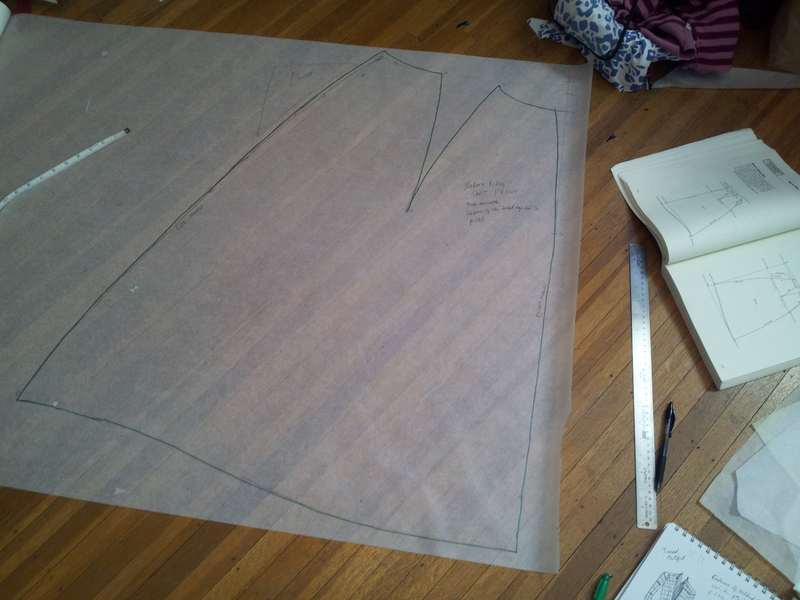 Drafting the skirt. I swear by Frances Grimbles books. So many patterns! Here’s the mandatory front/side/back pics. I love the length on this skirt and especially the bodice. I got that length by measuring on myself and looking in a mirror to see how long I wanted the bodice to be, drawing that length on the pattern and adding seam allowances. And the fun photos! 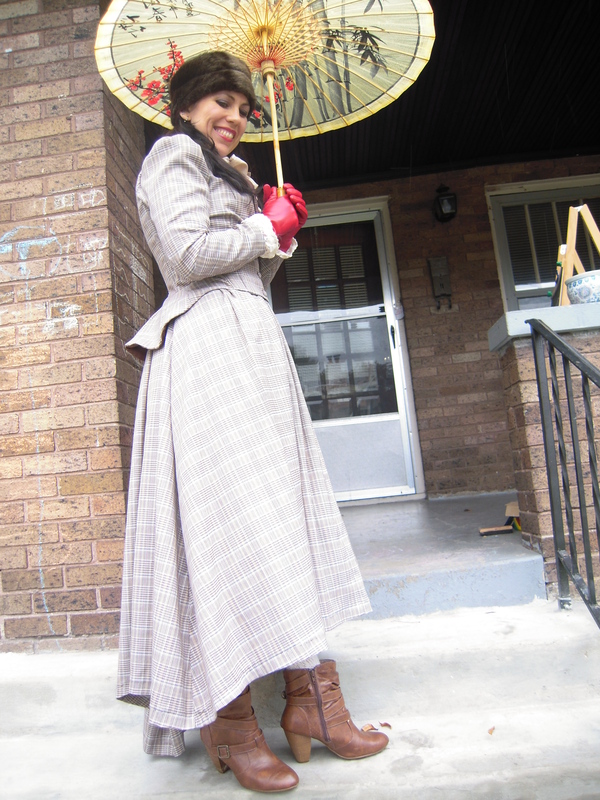 I used the parasol my friend Bethany got me recently while living in China. I love it so much and I’m so glad I had the opportunity to use it. And that folks is a pic heavy post. I’m super thrilled with this costume. I think it’s the nicest thing I’ve made so far. I do love working with wool and suitings so that probably contributes. Yeah, I made the head warmer thingie out of faux fur I got at The French Seam. I did buy the lace top I’m wearing and the bow you see is actually a silk scarf I added to make it look like it was attached to the blouse. Sneaky, eh? I did end up wearing my Go To Cape with the outfit because it was chilly! I’ll post pictures and talk about the picnic I went to later. This got long fast. 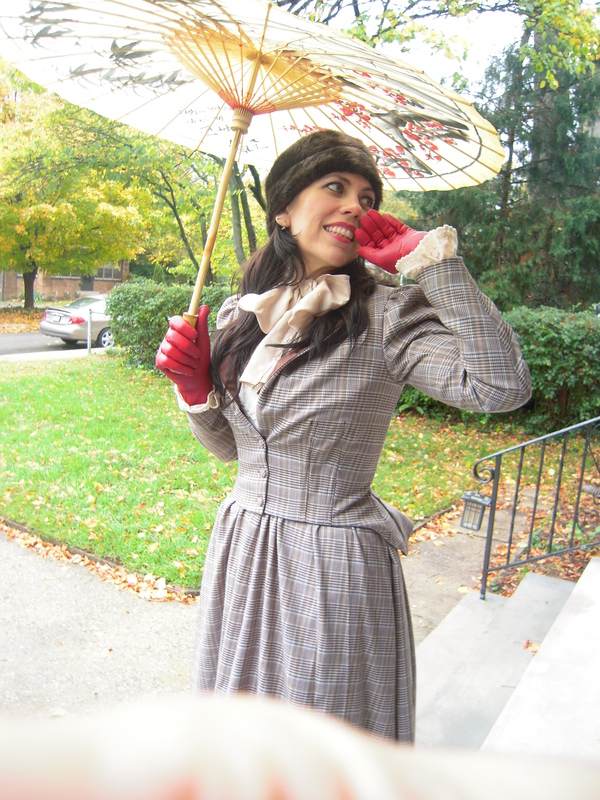 Now I’ve got two full Victorian costumes I can wear anywhere! 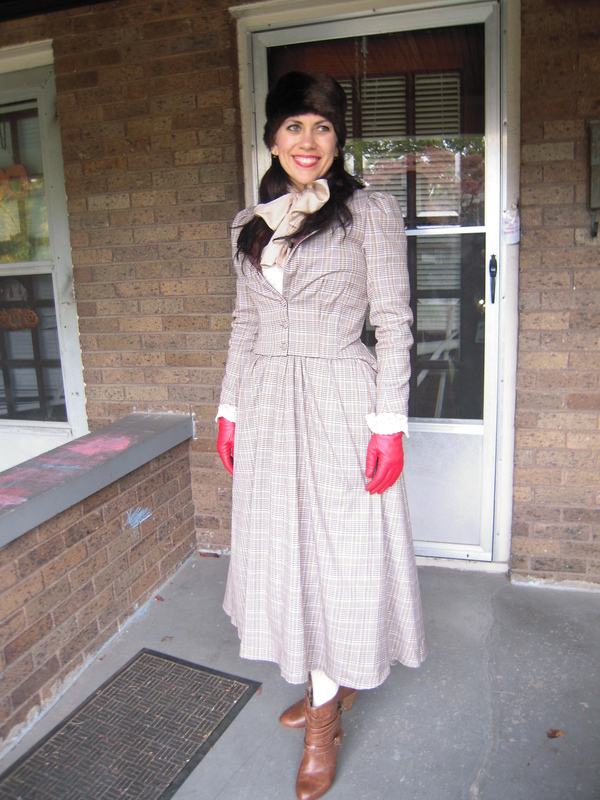 I’ll have my ballgown for February and then maybe add a real Victorian coat. Ooh, that would be awesome, right! Another Sugar Plum dress and I’m wearing leopard print! It looks amazing! You have mad skills. Can’t wait to see the picnic photos. Thanks! It felt kinda magical as it all came together. I’m gobsmacked! This is so lovely and you are very clever. Oh. My. Goodness! I so love this outfit/costume! (For the record, you could totally wear the jacket & blouse with jeans and no one would think costume!) 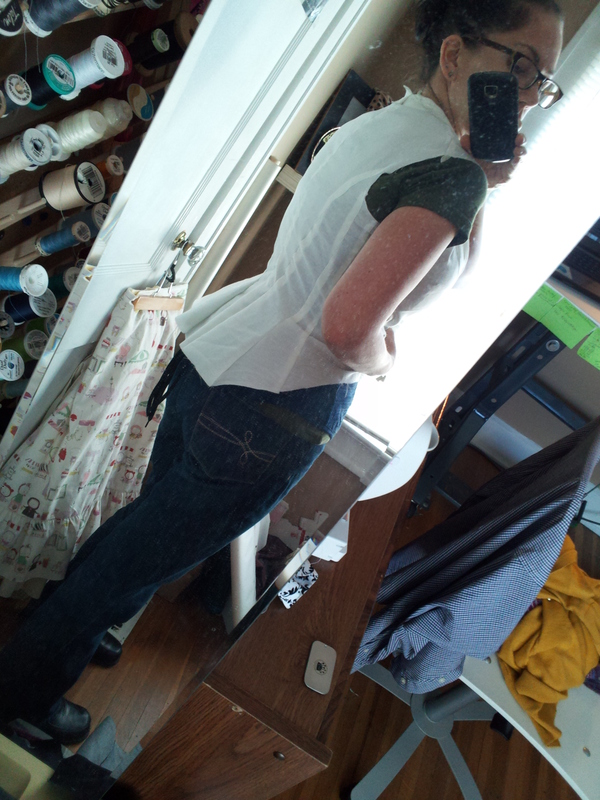 The lines are gorgeous and you just keep getting better and better with the fitting tweaks! The red gloves are really pretty with it and I love all your other accessories too! Thanks for your help! I really might wear the jacket with jeans. Totally works. Making costumes back to back helped me grow. It feels really good. Wow it turned out fantastic. Well done! Thank you. I’m pretty pleased. How f-ing cute are you?!?! Love this! hehe, thanks. Totally tapping into the theater background. gotta dress up! must! You look amazing. What a great costume. I love how it sits at the back. Thank you Kirsty. The back is always my favorite. Beautiful, beautiful…may you have many memorable occasions when wearing this! Thank you. I already have. I made some wonderful new friends this weekend. This is so beautiful. It’s wonderful how the look suits you. And the gloves are a perfect accent. Thank you so much. I do love this silhouette a lot. And the gloves did work out perfectly. I am dying for this!! You did an amazing job. We need to go to costume college sometime. OMGosh you are so good at the costumes – I am in awe of your skills and speed! This one looks fabulous. gorgeous – it really suits you! You look wonderful in this outfit. 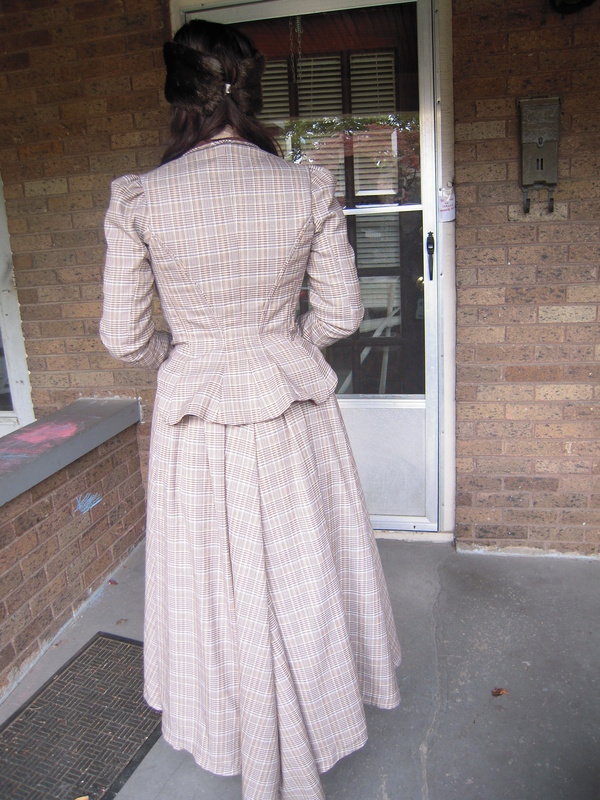 I really love the back of the jacket and how the line of the jacket and skirt follow each other. Beautiful job! Fantastic! This looks perfect! 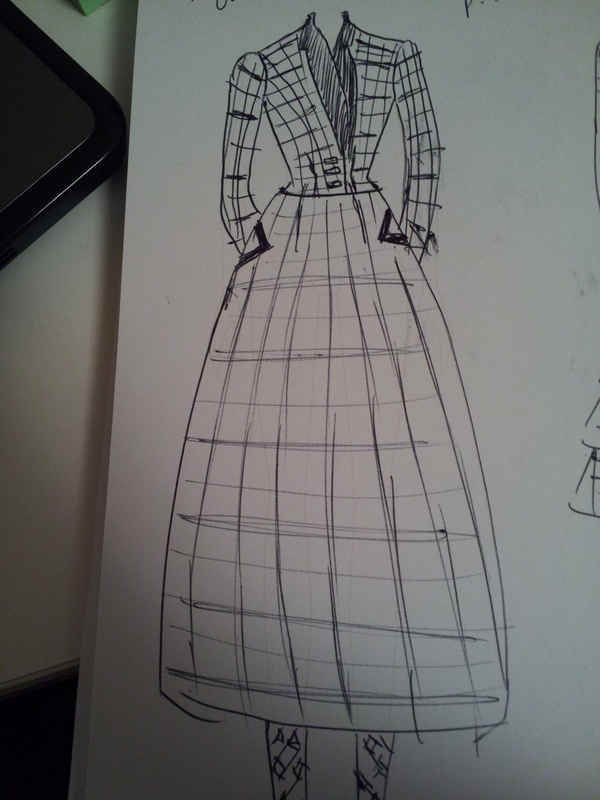 I can see you walking down the streets of Victorian London in this! GUH. How did I only just see this? I am in love. I absolutely love how this looks on you and I can only imagine how much time went into matching that plaid. It’s absolutely beautiful. And where did you get those gloves? This is gorgeous! It fits you so well. Thanks! I’m pretty proud of this costume!